In this interview, I give opportunity for the BBX Whistleblower. Cameron McKean to speak. He has a lot at stake, first pulling out of BBX, then doing it the way he did, and then his questions getting out and The BBX Investigation following. His answers to my questions are very similar in style to those we had engaging during my investigation. I think it helps to see another perspective from a central character in the BBX saga. Enjoy! 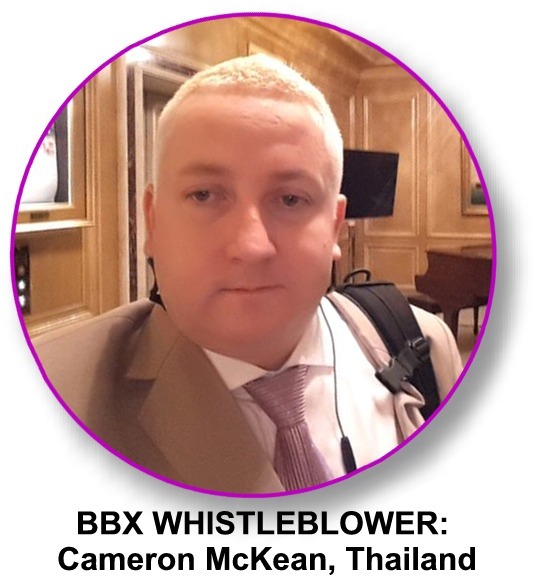 The BBX Investigation started with a tip to the Tipline that the BBX Thailand was pulling out, and that there was a huge cloud of smoke around the operations – summarised in 14 Questions he asked others to consider. Smoke, in my world means fire, somewhere. I considered it my job to find those fires and report them. It’s now gone as far as my stated intent to put them out but at the early stage I needed to just find them and assess them. Cameron was very helpful, pointing me in the right direction from the outset. It’s a little hard to build trust from scratch from a distance and it wasn’t all plain sailing but he had followed my blogging around this industry for a few years and knew enough to know that he could speak on and off the record and the relationship would be above board and professional. That helped a lot to build trust. That BBX did the total opposite shaped my thinking in the negative at the same time as Cameron shaped my thinking in the positive. He was careful but is an exuberant character, passion aplenty and quite willing to talk when you ask him things directly. He’s clearly a professional and doesn’t like lying or misrepresenting things so at times it was hard for him to answer some of my probing questions but he did help me a lot with the big picture of the BBX operations since Michael had died when I had not yet spoken to anybody else much from within. This was certainly quite valuable for me at the outset. In some ways he was probably a little too trusting which is probably, if he was honest about it, what got him into the pickle he found himself in with BBX in the first place! DS: Thanks for speaking to me on the record Cameron. You didn’t want to initially but now you do. Why now? What’s changed? CM: Facts are now all out in the open and I have been happy with the way you have reported this disaster that is BBX. DS: When I first called you, you didn’t open up immediately. You admitted that you’d sent a letter to BBX people explaining your resignation but you were a little guarded at first. Why? CM: At the time it was very busy for me trying to make sure my own affairs were in order. I was also not sure if you would simply attack me as many others had. DS: So what’s changed in the meantime? CM: Now that everything has come out I can see that most readers have understood that my intentions have been to better inform fellow business people and make them aware of what was going on behind the scenes at BBX. The feedback I have received has been generally very supportive and many have confirmed the concerns I have had about BBX. I thought I was going to be a lone voice and I have now discovered….. I am not. DS: I’ve reported the results of my investigation to the world and made assessments about many things, credibility seemed to be the big thing, but it took real evidence before I could determine reality. Talk to me about this BBX Investigation for you. It wasn’t easy was it? Explain to us what the issues were for you when I was grilling you. CM: For sure I have had some nasty emails. Friends and associates have had BBX and Bartercard accounts closed without warning simply due to being associated to me. My staff worked hard for BBX commissions and now Magali Russo has closed all staff accounts and taken the credits off the very staff she last year praised so highly. I am left in a position that BBX management are breaking their own ethical and member rules to hurt all the people around me in order to attempt to silence me or get back at me. DS: Let’s move on to your relationships – the BBX people to a man, have pretty much all cut you off and had a good whack at you. Mud sticks. I’m used to it but this has been hard for you. Can you explain for us what has happened and what your take on it all is? CM: The only thing BBX has done is attack me. At no time, have they provided formal answers to the questions and allegations raised and at no time have they provided any evidence to defend themselves. In my opinion, this is very telling and almost admission of the claims inherent in my questions. DS: I watched you struggle with the Whistleblower thing, getting labelled that is something you are going to have to live with; we talked about it and you knew that it was reality and ran with it. Why? People are going to forever know that you could turn on them if they are doing something you don’t like about them. Can you explain for us what this trust thing is all about? CM: I have built many businesses based on my reputation. I have staff in many countries and many businesses I support. The core of the reason I felt I had to come forward was if I said nothing and BBX collapsed then it would have been unethical of me not to have warned the fellow business owners of the dangers ahead. When you hear the word “Whistleblower” you think of the likes of Edward Snowmen and Julian Assange and I would never want to be in the position they are now in, so I was not really comfortable with the label. DS: And the claims that you have de-railed, or have an agenda? Have you? What is your agenda in all of this? CM: At no time, have I used this to sell and or promote any of my other businesses. I have stayed on point and simply reported my knowledge & concerns then put the questions out there. My agenda is to make sure that when BBX falls then nobody can question my integrity and point the finger at me as being one of the people that deceived the members. Now I think it’s clear I could not be accused of that…. and so my job is done. DS: How did you find out something was wrong with BBX? What was your main source? CM: The short answer is Magali Russo came to Thailand and while here told me what was going on in BBX. After a few drinks next to the pool one night she told my friends and I everything and it was from this that I learned what was going on, and that I too had been deceived. I have never told the full story of the events that took place with Magali Russo in Thailand, but needless to say, my staff and I became extremely concerned and my people really were quite distressed. DS: I read your emails to the BBX industry and as you know I grilled you about timelines and the lead-up to your resignation. In my BBX Investigation Report I came out with the results that you were squeaky clean. I don’t see any attacks on people from you. I’m quite direct and can even be obnoxiously so, but you are quite reserved, yet I know the whole thing has hurt you in more than one way. Tell us why you are so low-key about it all, I mean you have gone out there with some stuff that could have had (and probably will have) huge consequences for many people. CM: I grew up under difficult conditions and that made me quite tolerant. And living over 10 years in Thailand you need amazing tolerance. I had assisted BBX to promote to Australian clients for years. So I feel it’s only right when I see that the system is not working (the same original way it should have) to inform the members that trusted and followed me. We are talking about people that have also supported me and my many businesses over 15 years and I am not the type to simply look away as they are being misled. DS: And your take on the exposure that your story is now getting? CM: Honestly I am not at all surprised the members are reacting, but when I get calls from News agencies on my mobile, I am a little surprised at the level of interest. Many clients feel they at least have been misinformed and are unimpressed and this has caused them to take a keen interest in this unfolding drama. One current concern I have is for BBX members who have not declared their barter income in their tax returns. The data is out there now and can’t be taken back. BBX members need to make sure they have correctly reported on their income or the next part of this story is going to be, as you say, blanket audits on barter members from the Tax Man. DS: And the direction I changed from simply investigating to activism? CM: This I think is a natural progression for things like this, now that a large group of people have a common agenda. The aim would be to protect others from unscrupulous types in the Barter industry. I personally have a number of other projects that I need to focus on now but I hope what I have done has better informed the members of the true state of affairs. DS: What are you going to do? Can you survive without income from the BBX business? CM: BBX was never profitable for me in Thailand. It needed me to invest and I did so expecting support from BBX Australia. The promised goods never arrived and support was virtually nonexistent. BBX with the support I was promised and the new updated systems and mobile apps in the local language could have changed everything here in Thailand. Like I said before I have too many projects and I am happy to walk away from BBX and start working on my many other long standing Software and Internet related business and pet projects. I am walking away from a large loss with BBX and all I can do is consider it a capital loss. DS: Wave a magic wand over this whole BBX thing, then read the crystal ball – what do you think should happen? What will happen? CM: BBX Management are unlikely to admit the wrongs and replace management, as such the Members and the BBX currency are doomed. The members did not vote for the current Directors and Management of BBX. Add to this, some BBX companies still have the deceased Sole Director Michael Tooma as the proprietor! I did everything I could last year flying two times back to Australia and meeting with the BBX Management. It was clear they did not want to listen and thought they knew best and that they could do what they wanted. The way I look at it, they did not care what was in the best interest of the members or the BBX business. I think that when an owner of a Trade Exchange (like BBX) dies an Administrator must be appointed until normal legal process can be followed. As BBX in Australia admitted to me they were insolvent at the time Michael Tooma was in Hospital the business should have been liquidated as per the member agreement and normal legal process. Members in debt must pay it back to the administrator in cash. That amount is then split up and handed back to the clients that had a credit. This is what the members agreement said would happen. BBX can’t be saved now. DS: And that is because of what? Falling confidence within the exchange? Or criminal events? Or IRTA, or what? CM: With the truth now being out, few will now accept BBX currency and as such the system is what some in the business call “Lockup”. Even the few die hard traders are going to find it difficult to trade with greater than 70% of members not willing to trade goods or services. Add to this the cost to run the business must now be greater then the amount of cash income generated by member fees generated by transactions. The transactions don’t happen, the fees don’t generate as such BBX is insolvent unable to pay its huge running costs. IRTA is a side-issue – a non event. As you well know, I don’t know why you keep talking about them. DS: You’ve seen The BBX Investigation get published day after day and you’ve been involved in my blogging especially in the early stage as we have chatted over the last month or so. What’s your take on the whole thing? I know you’re pretty happy because it vindicates you, but putting your own reputation aside for a moment and trying to be objective, what’s your take on it all? CM: I hope this helps people in the industry create a revolution and future Barter exchanges must be setup in such a way that the business is owned buy the members and any loss of management would be voted on by the members not a family that acquired the business from a relative. I hope this will change the industry to make the Owners and Management more accountable. DS: The industry then . . . we’ve got huge problems within it haven’t we? What’s your take? Is it corrupt to the core or is it just a few bad ones in there? CM: Unlike others I still believe in barter but think we need a “Barter 2.0” revolution learning from the past and form other new successful digital currencies. The world is changing faster than ever and its time the Barter Trade Exchange industry catches up FAST! Barter is making a comeback in other parts of the world and I am sure it can still work. DS: And on the scale of 1-10 from zero to hero, how bad is BBX do you think – when it comes to corruption, lies and all that? CM: I don’t think my personal opinion is now important people need to look at the evidence presented and work it out for themselves. DS: And you say that because of the Thai laws of defamation? CM: Defamation is a Criminal offence here in Thailand unlike Australia and New Zealand. For this reason, I present questions and evidence and allow the members to make up their own mind. DS: But you pulled out and let everyone inside know the reasons why, so I guess we know the answer to that question anyway. Talk to me about Michael and the Touma family. How long have you known him (and them) and how did you get on with him/them? CM: I have known Michael Tooma for around 20 years. I owned Computer and Internet companies back in the 1990’s and Telephone and Internet providers more recently. As one of the largest non real-estate traders in BarterCard and BBX over 2,000 Australian members used to pay for my services using barter every month. I did all I could to use my databases and marketing tools to help BBX get leads and new members and was responsible for a large number of clients joining or remaining with BBX. Unfortunately my relationship with BBX ended with the unfortunate death of Michael Tooma. After his death I discovered that I too had been deceived. DS: Your new operations – Club Barter. The story from BBX is that you set up a competing exchange and stole the BBX members. The you got found out and booted out of BBX for it. I know the real story as this was a key part of my investigations and I didn’t take it out there immediately because it was a side-issue for me. You’ve now stated that this claim from BBX is false to all the BBX members. Do you want to share the details a bit more now? CM: Yes, it’s totally false as I did explain in one of my emails to the BBX Members. Club Barter Limited used my software I built a few years ago for my Bitcoin business and BBX Management knew about my software for a very long time. I am not a director or shareholder of Club Barter. I gave the software to my Thai staff who own the company in Thailand and wish to continue to service the clients in Thailand. The BBX Thailand staff loved the business and are very hard working. The growth in Thailand was amazing. Why should the amazing team in Thailand suffer from all this even more? By giving them my software I have empowered them to continue running a barter business with their very loyal clients – without BBX. DS: And the core aspects of what you’ve just said, you have shown me the evidence in some cases going back years, but the reality is that we all know that you are a very smart man and had probably planned your future well. Did you plan this all the way back and if so what was in it for you? Or did you have your hand forced and feel you had to do it, like you intimated in the two emails you sent out? CM: I thought everything could be fixed and resolved. Michael Tooma originally came to Thailand and asked me for my assistance. He asked for my advice and I felt I was going to be able to work with him to help drive the future of barter. I believed him.. But I soon saw trouble ahead when his promises got broken. Michael told me he would send container loads of wine from Australia to Thailand 100% BBX so we would have a core product we could use to attract more hotels and restaurants. This was core to all talks and agreements and he had done it once before. But this just never happened and I soon discovered he had sold the last of his stock to other members. That was all promised to me. Basically he conned me to get involved! If I knew the truth back then I would never have been involved with BBX. DS: I sensed that you were tense, maybe uptight with a high stress situation and that you didn’t really like it when I started grilling you too. But you seemed to relax a bit after a while and now feel that the air is clear and the thing is all over and done with, now that The BBX Investigation is done and out there. Talk about those feelings and how you progressed through what is really a grieving process. CM: Yes, I lost a business I worked hard on for 3 years and had been getting all my friends and family involved in. I did not ‘just have staff’. Many of my people have known me for years and we all loved working together on this BBX project. I felt and still do that I have let them down as they looked to me and quit jobs to work for me and grow the BBX Thailand business. It was not the fault of BBX Thailand that all this happened. But it was clear things were going to get worse, not better. DS: The BBX management? I’ve blogged that Magali visited Thailand to try to reinstate the BBX thing up there. I saw a video of perhaps a dozen people in a room including the new BBX team. That must be pretty insulting mustn’t it? You’ve told me that you’ve helped them all over the years but it’s like you’re enemy number one over night! CM: Sorry, I can’t comment on that as my lawyer is currently filing criminal charges in the Royal Thai Criminal Court. DS: One of the comments that I got from other BBX people was that you are new to the industry. You corrected me in this because you have said that you’ve been involved in barter for a long time before your involvement with BBX Thailand. Care to explain to all? CM: Most people in BarterCard and BBX have known me for over 20 years. My phone and Internet companies serviced thousands of Australian clients for years. I traveled Australia doing Barter Expos and other events for many years receiving top trader awards very often. If anyone makes that claim, ask yourself what their agenda might be. CM: Bartercard and BBX all used my services. I used to purchase property on Bartercard with the funds that I would earn from clients paying Phone and Internet services. Bartercard used to look after me and I in return would assist them with 100% Barter phone bills and deals for new members to get them to join Bartercard. DS: I’m usually quite up with the play in the industry but you caught me out on one thing when you said something pretty innocently once that BBX was a member of IRTA. I said, “No. Only BBX UK was,” which was what I thought. Things had changed though since Michael had died and you were dead right. They did join IRTA, sort-of. I wrote my thoughts in The BBX Investigation. I know that their joining IRTA irked you the same way as it did me as we talked about it. Explain to others why this bugged you so much, I mean wouldn’t having your exchange part of an International Association help you? That’s what they would have said to BBX, I am sure, when they signed her up. CM: Michael Tooma made it clear to anyone that would listen that IRTA was “in bed with Bartercard” (as he put it) and it was not something he would ever get involved in. He hated IRTA with a passion as he felt the membership rules would only hurt his business and make him less competitive. As you can understand I was shocked when Carolin contacted me and wanted BBX Thailand to join IRTA. I refused. I simply don’t understand why, when Carolin knew how her father Michael Tooma felt about IRTA, then as soon as he went into hospital, she went out to sign a deal to join them! BBX Thailand never joined IRTA and I refused to, point-blank. DS: The Hong Kong thing – talk to me about that. Are they an Aussie outfit or Hong Kong, or International? It seems like Hong Kong is just a front. Michael and co all lived and worked in Sydney. I never really saw anything that made me think that Hong Kong might have anything tangible up there. The dozen or so members they have are only their own entities, all in debt. What’s the real score? CM: This goes back to their IPO disaster on the ASX. Michael told me he purchased the BBX business back from the Public Company for just $2 then separated the BBX assets and business from the public “BBX Holdings Limited” company. BBX has no staff or active business in Hong Kong. BBX for over 20 years traded as an Australian business. It was started and grown in Australia and many clients had no idea it was no longer an Australian owned business. Michael told me he did not want to pay tax on franchise money he felt he would get selling international franchises in countries such as China and so the Hong Kong company was formed. DS: OK. So let’s talk about risk and exposure. Tackle your own situation first. Are you exposed in any way from your dealings with BBX? CM: My franchise agreement was never executed even though I tried many times to do this. I resigned from the BBX project and from the franchise. In my opinion the Thailand Master Franchise Agreement is not legally binding and this is the reason BBX has not (despite what they have said in public) commenced any legal action against me. DS: What has surprised you the most over this last month or so as The BBX Investigation has unfolded? CM: Well, I’ll give you an example . . . I received an email from Wayne Sharp* replying to an email to BBX UK members. I was surprised that he would get my email as a founder of the competitor Bartercard. I soon realized that he had accounts with BBX UK despite rules that don’t allow staff of either trade exchange in doing business with a competitor. I don’t understand why he would have an account in a competitor Barter Trade Exchange? His email was extremely threatening and aggressive and he suggested that he knows where I live and that he would “Hunt me down like the dog that I am”. Bartercard closed my account and took all the funds when they found out I was involved in BBX 3 years ago. Now I see that Bartercard management have BBX accounts? This does not add up for me and would seem something fishy is going on. DS: Oh yes, for sure! The BBX Investigation is sure to roll onwards on that score! And your advice? I’ve given mine to various people in The BBX Investigation – what’s yours? CM: BBX Needs to call in the administrators and see if they can clean up the business or at the very least liquidate it in the way outlined in the membership agreement terms. It’s not a healthy picture but it might get something back for members in credit. Other Barter Trade businesses need to take notice of what’s going on and make sure they are fully transparent with their members and supporters. DS: Whats going on with BBX in Thailand now? CM: BBX does not have any original signed contracts in Thailand. It became clear to me BBX lost all backups and also never received the original signed contracts from the original BBX franchise. I have reason to believe this issue affects other countries as well. As such, especially in Thailand we have been told by the Thai Courts and countless lawyers that the agreements and any related debts are not enforceable. This was the first thing I discovered after I took over the BBX Thailand operations. Clients in Thailand have been asked to pay back credit lines and pay additional monies but BBX do not hold any enforceable contracts. This is why BBX Thailand can’t proceed. The law in Thailand will not allow action against a business without an original signed contract in Thai language. I ask members in Thailand not to pay anything unless they are ordered to do so by a court of law in Thailand. CM: I don’t hate the Barter business and feel strongly that Barter is about to make a big comeback but first, matters like BBX need to be resolved. The barter industry can learn a lot from the huge success of digital currencies such as Bitcoin. Yes, I have received some angry email replies. People are looking for somebody to blame and automatic reaction is to the shoot the messenger. BBX is not my business. I don’t own the system and or any of the infrastructure. This should never have happened and the people responsible are the owners of BBX. The BBX currency belongs to the members as it comes from the goods and services the members provide. When management do bad deals that are not profitable for BBX it hurts the value of the BBX currency. This is a direct slap in the face of the BBX members. I do not believe Carolin MacDonald is a legally appointed Director of BBX International Limited. Based on what her own sister (Magali Russo) revealed to me on her trips to Thailand over a few drinks, I can honestly say there is no possibility that Michael Tooma signed any documents while in Hospital. Magali told me that when Michael Tooma fell he hit his head badly on the street curb and the doctors had to remove a piece of his skull. Within 2 weeks the Doctors told the family that Michael Tooma would not recover and they should make arrangements. Magali Russo told me that she and her sister practiced signing Michael Tooma’s signature and Magali Russo was able to do a more convincing copy and that was used on a number of documents. My point here is that if signatures were forged then Carolin is not legally the director of BBX International Limited or possibly any other company and as such the Police and Bank should immediately investigate. What has happened should NOT have happened – ever. I warned BBX about system security 3 years ago and every year since but they did nothing about it. Others have too. If BBX followed the advice of their IT staff and others none of this would have happened. The breach in member data is a direct result of bad management and the management of BBX need to be found accountable for any damage this has caused to the members of BBX. DS: Thank you Cameron. Don’t you worry. They will be . . . they will be! In the final post of The BBX Investigation I vent at BBX CEO Carolin MacDonald and don’t pull any punches, basically telling her straight, that she and probably others will be going to jail. It’s the only thing suitable IMHO. We have to LEARN how to be unfree through a lifelong diet of propaganda that teaches us to subordinate ourselves and be afraid of men in caves. Carolin has recently denied that BBX is going into liquidation. It will be interesting to see what happens next. Perhaps they are trying to finalise their financial affairs and make good what they can before handing the business over to the liquidators? The business practices that BBX ran were shambolic and negligent at best. Even a simple matter of transaction settlement has no formal procedure!!! It seemed that fees were the primary focus of any deal. The allegations you have made in your research Dennis are additional to these poor practices and very revealing. Thanks to Dennis for providing a forum for all the aggrieved members to air our concerns. Thank you John, revealing is the word eh? Yes. Broke. Desperate and still an IRTA member! What a disgrace. It’s going to be pretty hard to run a company from within a NZ jail though The only thing MT and Co were good at was concealing the debt . . . just like the other Aussie barter company! It’s all BS. Watch the cockroaches flee though when the light comes on. First to go was Brain Hall with his golden parachute. Next to go will be Trevor Dietz. It’s all very predictable.